Popocatépetl, with 5426m asl it’s Mexico’s second highest peak. 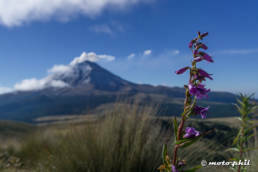 But located just in between Mexico City and Puebla, it certainly is the most popular Volcano and it is still active giving you often the change to see large clouds of smoke emerging from its crater. Best time to see it is usually between November and February since the peak will be covered in snow adding that cool icing to the cake. The name Popocatépetl comes from the Nahuatl words popōca [poˈpoːka] ‘it smokes’ and tepētl [ˈtepeːt͡ɬ] ‘mountain’, meaning Smoking Mountain. The volcano is also referred to by Mexicans as El Popo. The alternate nickname Don Goyo comes from the mountain’s association in the lore of the region with San Gregorio (St. Gregory), “Goyo” being a nickname-like short form of Gregorio. Philip invited me to come and stay with him in Puebla for a few days. 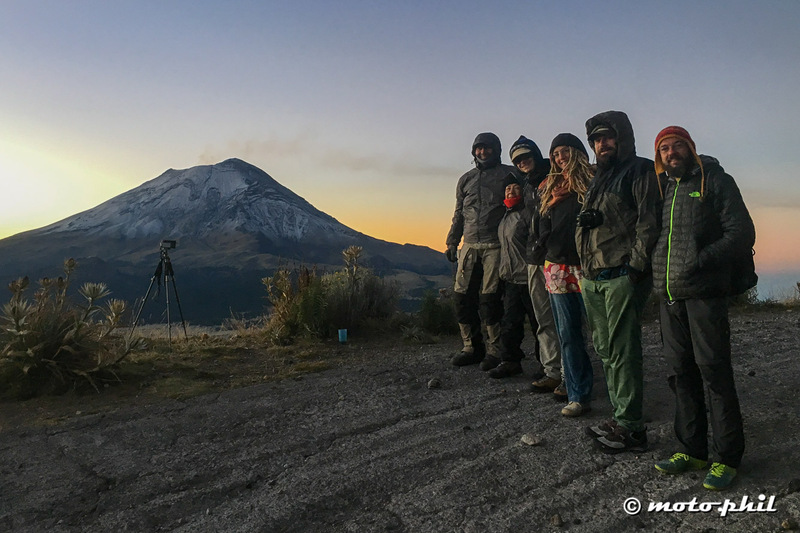 It’s the perfect location for taking a trip and explore Popocatépetl from Iztaccíhuatl – Popocatépetl national park. I get up early and the weather looks good, no clouds on the sky and more importantly no clouds getting stuck on the Volcano. 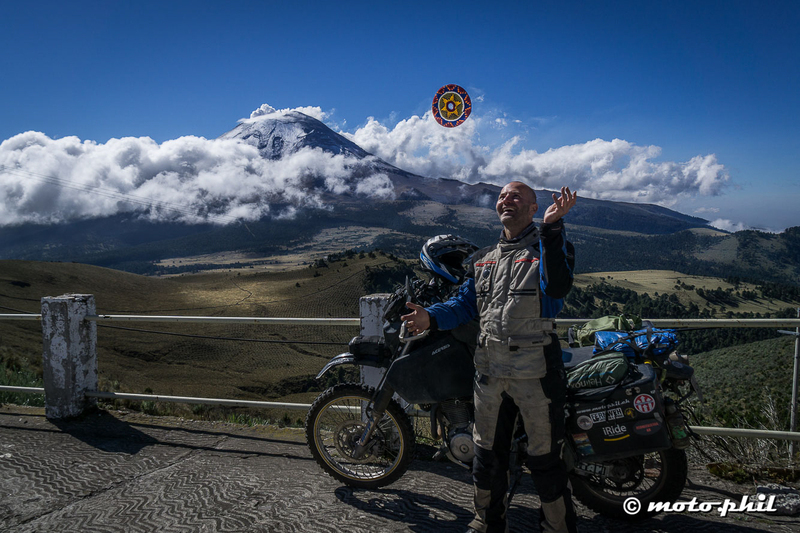 A perfect day for taking a day trip up Paso de Cortes to have a better view of the Volcano. But… After having been eating mexican food for two months the italian Pizza the night before has upset my stomach. I spend the whole morning between bathroom and checking the weather again at the window. Seems like I have to handle a different kind of “Popo” (german for “bottoms”) before I can go and see the Volcano.I just hope I eventually get rid of what’s messing with my internals. Around noon, finally, my digestive system starts to calm down and I prepare to get going. Should still be enough time for a decent day trip to get a good view and maybe a good photo of Popo. The road to Paso de Cortes is a dirt road coming from Puebla (east) side. So I figure I might as well lighten my bike by taking out some of my equipment like camping gear and only take what I need for a day. Should be more fun navigating around stones and potholes with a lighter bike. 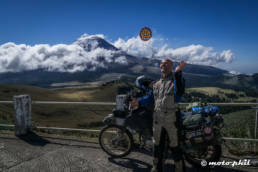 Arriving at the Albergue at just above 4000m asl I get a last glimpse of Popo before it's been taken over by the clouds. Spectacular view! I’m opting for the highway route out of the city to get there faster. And here comes the next stopper: Heading out of the city, approching a highway split I have to change to the left lane. I check the mirror and have a quick glance back. When I turn my view back ahead, the car in front of me has shining bright red lights and goes full brake. While I do the same time seems to slow down as it usually does in such situations. “Ok, I am going to fly! What’s the best way to give a clean superman impression and hopefully land safely?” goes through my head. My front wheel hits the bumper bar of the car that has stopped by now. The rear end of my bike starts to go up, up, up and then stops and gets back on the ground. I am still on my footpegs, now standing being happy and more so amazed that my superman impression has to wait for another opportunity. I look back and find myself lucky that the truck behind me had enough distance to stop just in time instead of crushing me and my bike in between him and the car. My guardian angels definitely watching out there and a reminder to take a step back from adapting too much to local drving styles. Me and the car pull over to check the situation. The mexican driver gets out of his car and first checks on my health which is not any different from before (except my stomach seeming better now). I chuickly check the forks of my bike and it seems all ok, can’t see any cracks or bent materials. Next we check his bumper bar which only shows a few scratches. I offer him a card with my contacts in case my insurance needs to take care of that. But he’s answer is mexican stlye: “No don’t worry about it!” More luck not to get in a paper war with insurances. Off I go again, steering and fork doing it’s job just fine. Time to hit the dirt road up the Paso. Obviously the road has recently been flatted again by some big road machines, it’s far less technical than what I expected. 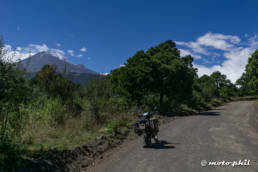 But still it’s a fun ride with some rocks, potholes and puddles and every once in a while I get a glimpse of beautiful Popo. 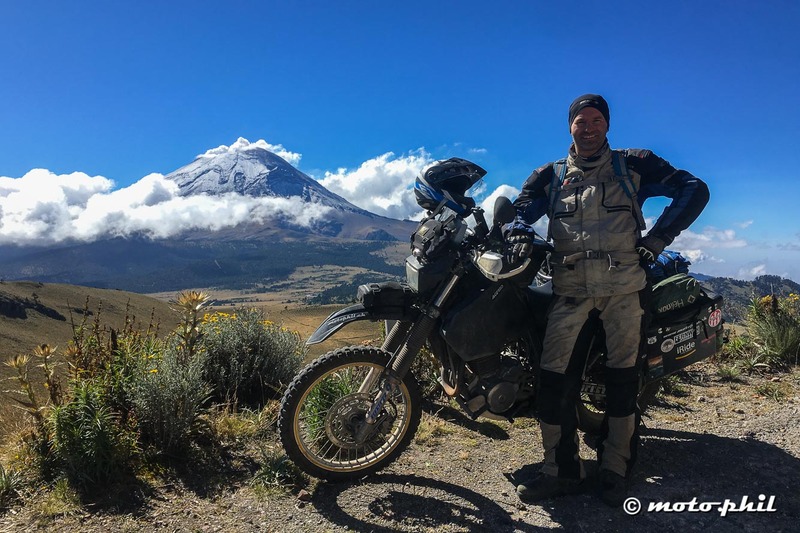 After having a coffee and enjoying the view of the Volcano on Paso de Cortes I decide to head up the dirt road to La Joyita, a small place on Iztaccíhuatl which is located just north of Popo and Paso de Cortes. On my way up there I follow a sign saying “Albergue” because it seems like a good vista point since it’s located nicely on a hill. Just arriving I only get a last glimpse of Popo, by now the clouds have started to sweep in and hide what I came to see. You remember, I took all out my camping gear so there seems no way for me to extend my day trip to an over nighter. 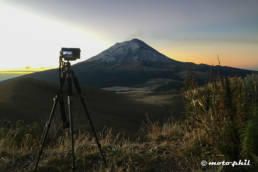 Volcano Popocatepetl at sunrise. The light creates beautiful colors while El Popo decides to have a smoke. Shortly after a car arrives and a mexican jumps out. 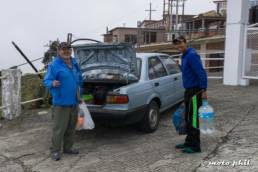 I start talking to him, he’s a mountain guide expecting some people to take for a hike the next morning. He says I can stay over night in the Albergue with him and the other people. “But I don’t have my sleeping bag and neither any of the things I need for my contact lenses.” – “I can lend you a sleeping bag if you like and I have enough food” he says. Sleeping bag is sorted, but I have concerns about my contact lenses. I have slept with them before and it’s horrible to wake up with them in your eyes. Throwing them away is not an option I still have to see where I ride the next day and my glasses are also back at Philip’s place. Nevertheless I decide to stay over night. It would be a shame to be here and miss sunrise lighting up Popo in the morning, the time when there are usually no clouds. The gang enjoying the sunrise at Popocatepetl. Mind it was very cold at 4000m, I put on everything I had. I have to hang around wearing all my motorcycle gear, since I didn’t bring any other clothing either. 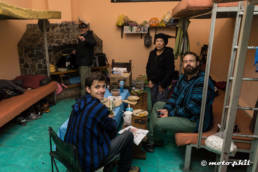 But I am having a great time meeting cool people and enjoying a good mexican camping dinner up there. A german traveller couple, a french and a swiss french guy, two mexican mountaineers and the guide and his wife make the evening up in the cold enjoyable. The sleeping bag I borrow is, of course, mexican sized too, but I manage to put my whole body in there somehow and stay halfway warm throughout the night.